Whitemud Drive serves as an important east-west goods movement corridor and commuter route through the City of Edmonton. While a substantial portion of the Whitemud Drive corridor exists as a freeway today, there are portions in west Edmonton which do not currently meet that standard. Furthermore, the Province of Alberta has completed a functional planning study and is currently in the process of completing the detailed design for the realignment and upgrading of Highway 628 from the West City Limit westward to Highway 60. Combined with increasing residential development in west Edmonton, this has resulted in the need for the City to re-examine existing concept plans for Whitemud Drive from Anthony Henday Drive to 231 Street. Several previous concept planning studies have been completed for the corridor between 2001 and 2011 which determined the location and configuration of grade separations along Whitemud Drive and set right-of-way limits for the corridor. The original study, completed in 2001, was updated several times to revise lane configurations and to match the planning work being completed by the Province of Alberta west of 231 Street. 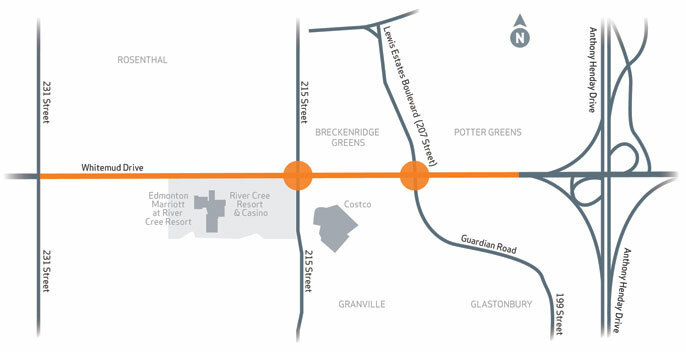 The previous concept planning studies have recommended grade separations at Guardian Road/Lewis Estates Boulevard, Winterburn Road (215 Street) and Hillview Road (231 Street). An update to the Whitemud Drive concept plan was undertaken to respond to changes in proposed development and to respond to ongoing development pressure on the surrounding road network. Furthermore, an update was required to provide the City and surrounding developers with a better understanding of future construction staging and timing of road network upgrades, as well as to review opportunities to mitigate impacts to the surrounding communities. The planned interchange at 207 Street was changed to a fly-over due to close proximity to Anthony Henday Drive and Alberta Transportation's future plans for upgrade the Whitemud Drive / Anthony Henday Drive interchange. The planned interchange at 215 Street (Winterburn Road) was modified to better accommodate anticipated future traffic projections. The distance from ramps to property lines was increased to reduce impacts to adjacent communities. Access to Enoch Cree Nation was modified south of Whitemud Drive to better interface with the proposed 215 Street interchange. The updated concept plan for Whitemud Drive between Anthony Henday Drive and 231 Street has been approved. The plan sets the stage for a future freeway configuration through this area. At this time, there is no funding for this work. The timeline for implementation is also unknown. City planners held an open house to present draft long-range concept plans for Whitemud Drive West between Anthony Henday Drive to 231 Street. This was an opportunity for Edmontonians to learn more about the project and to provide feedback on the plans. The materials that were displayed or distributed at the event are listed below. View details of the developer projects happening in Edmonton including the construction on 62 Avenue, 215 Street to Granville Link.